Anyway, this is seriously delicious — I don’t think you’ll regret it if you try it. Plus, this only makes two teeny individual crumbles, so even if you don’t like it, you only lost one apple, right?! Clearly I’m not much of a salesperson. 1. Preheat the oven to 350 degrees F. In a small saucepan, heat butter until melted, then continue to cook, stirring constantly, until butter has turned a dark brown, nearly black hue. This is darker than traditional brown butter, according to Adrianna Adarme’s recommendation at A Cozy Kitchen. She rocks, I believe her. Remove from heat and set aside to cool. 2. 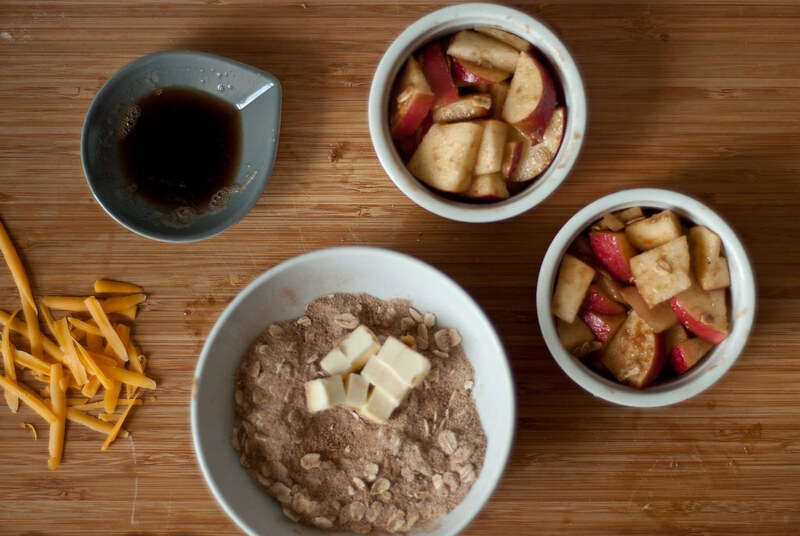 In a medium bowl, whisk together the sugars, flour, oats, cinnamon, nutmeg, and salt. In a separate bowl, combine about a tablespoon of this flour mixture with the diced apple. 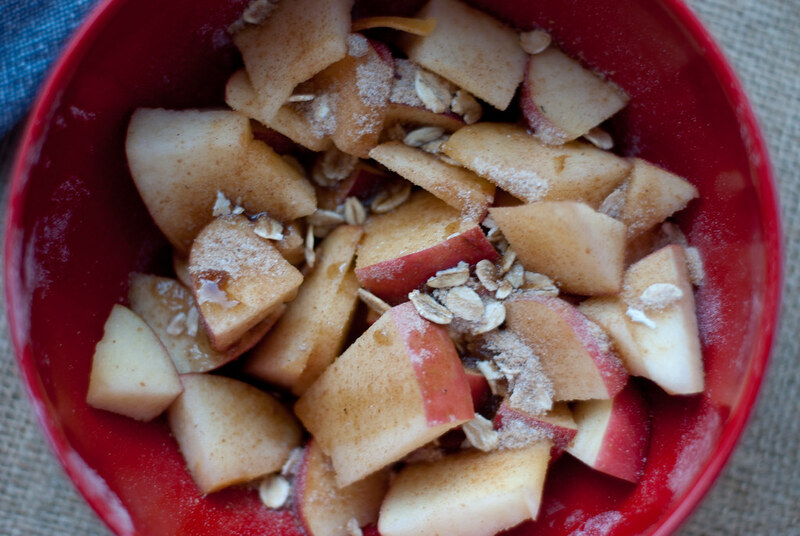 Pour about half the brown butter over the apple mixture and toss to coat. 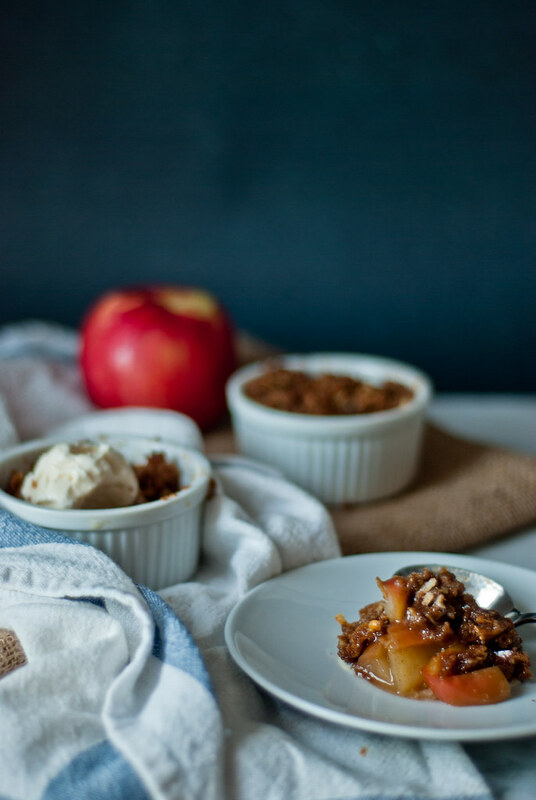 Divide the apple evenly between two 4-ounce or 6-ounce porcelain ramekins. You can fill it up quite tall — the apples will shrink as they cook. 3. To the original bowl with the flour mixture, add the cold (not brown) butter and work the mixture together with your fingers until it is crumbly and forms clumps the size of peas. Pour in the remaining brown butter and mix again until thoroughly distributed. It should be the consistency of wet sand, and should clump together if you squeeze. If using, mix in the cheddar cheese. Sprinkle the topping (or, in my case, pile precariously) over the two ramekins. Again, it’s fine if they’re tiny mountains — they’ll shrink a surprising amount. And lastly, you know, if you’re just really attached to the idea of pie on Thanksgiving — I can’t blame you if you are! — I think this would work perfectly, too, as a filling for miniature apple pie tarts with crumble topping. I’m also sure that this would work if you tripled or quadrupled the recipe and made a full-size apple pie out of it. There’s no leavener or egg, so you won’t run into any problems proportion-wise by scaling it up. For a fantastic pie crust recipe, check out the crust I used in these pear galettes using a phenomenal and foolproof (obviously, since I made it) pie crust recipe from Courtney at Neighborfood. Otherwise, check out a few of these fantastic-looking pie recipes below. And tell me how they are, because I’d love to try them! These impeccable miniature pie tarts by Jennifer at Savory Simple. I need them in my life. All of the pies in this slideshow by Gourmet Magazine, but especially the caramel pumpkin pie and the maple buttermilk. Speaking of buttermilk pies, this chamomile buttermilk pie by Adrianna at A Cozy Kitchen also sounds divine. And speaking of pumpkin pie, this classed-up bourbon pumpkin pie with walnut crumble by Nancy at Gotta Get Baked. 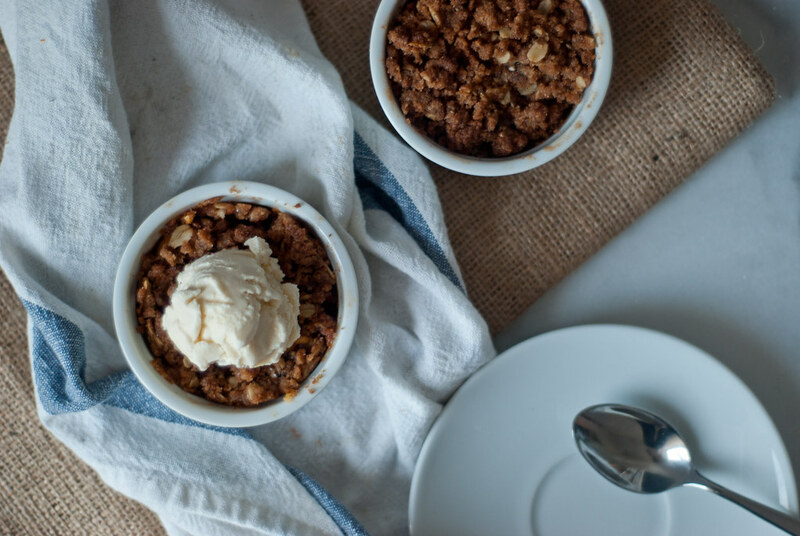 This sky-high apple toffee pie by Une Gamine dans la Cuisine. This salted honey pie by The Baker Chick, or this wonderfully unique rose and salted honey pie by Adventures in Cooking. Oh, and lastly — I just moved to a self-hosted WordPress blog this past week (!) and redid my layout! I’m still working through the kinks, so I apologize for any random mishaps you may encounter when viewing my blog in the coming weeks. For anyone who has gone through this process, I’d love to hear your experience and your thoughts! And more generally, I’d always love to hear anything you think I should change or improve about my blog in general. First, congratulations on the big move! I have yet to do it (new stuff scares me), but I am encouraged when I see fellow bloggers make the WP.org leap. Your layout is gorgeous and I suspect your following will continue to grow and grow. 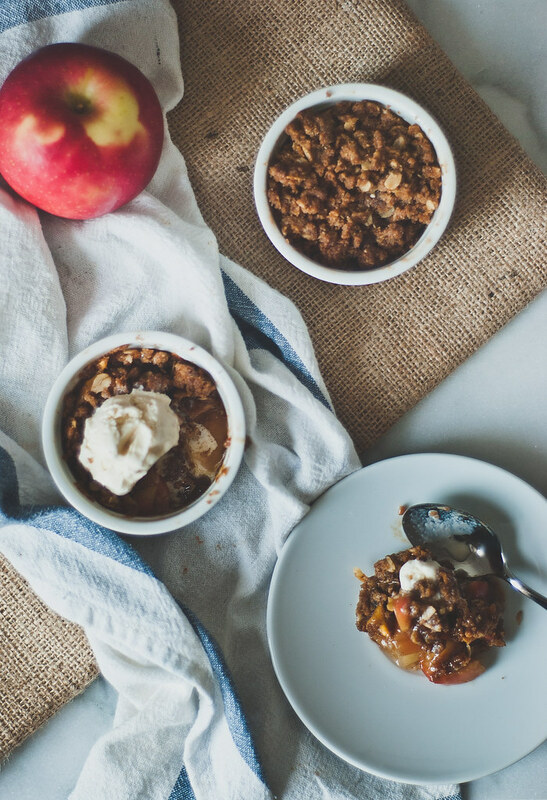 I love these ramekins filled with all sorts of apple goodness. There is something so special about serving individual deserts like these (versus hacking into one large pie & leaving part of the crust in the pie plate). Thank you for the inspiration and the recipe! Aww, I am so glad to hear that from you, both about the desserts and the layout! Thanks for being so wonderfully encouraging. I was pretty nervous about making the leap myself but I figured I had to do it sooner or later. I’m sad to leave the WP.com party! By the way, out of curiosity, how did you see this post? I assume I don’t show up on the WP Reader anymore, but I have no idea how any of this works, really… so just curious! Yes, you did show up in my reader! You can’t “like” a post and I was not able to comment from there, but just had to click through to get to your site so I could finish reading and then post a comment. Other blogging friends who’ve gone to self hosted continue to show up in my reader, which is wonderful & makes it easy to stay in touch. A question…did you have one of the “happiness engineers” transfer your blog? This is one of the things that scares me a little (because of my technology inadequacies). Thanks for the info and best wishes for continued success! Oooh, I got it. Yay, that’s wonderful! Like you said, I’m so happy I can continue to stay in touch that way. You know, I’m kind of embarrassed to admit it, but I did have them do it for me! I just don’t have the time lately with work to devote to figuring all that out (especially when I’m not tech-savvy and could very well mess something up and create lots of extra work for myself). I’d recommend doing it 🙂 It was worth how painless the process was! Thank YOU for keeping in touch and for your lovely comments!! Are you trying to kill me?? This looks amaaaaazing. And ah, congratulations on the move! You must let me know how it is — I have big changes in mind for my blog (I know, I know, agaaain) but I’m still feeling it out for now 🙂 But the layout looks great! 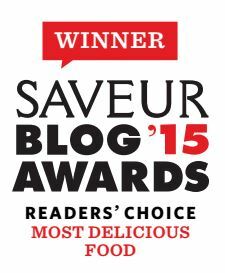 And, of course, I want to eat everything on the blog. Good Lord. Hahaha, thank you so much, Sara! I thought of you and your wonderfully designed blog when I was blundering around in CSS this weekend. We should definitely talk (aka you should teach me your ways since I know absolutely NOTHING. It took me like three hours just to figure out how to import Google fonts.) I like it so far but I’ll keep you posted! And we still need to get together one of these days! And yes, let’s please grab coffee (or I can just sit in your kitchen and eat things, that’s cool too) soon! Yay for going self-hosted! 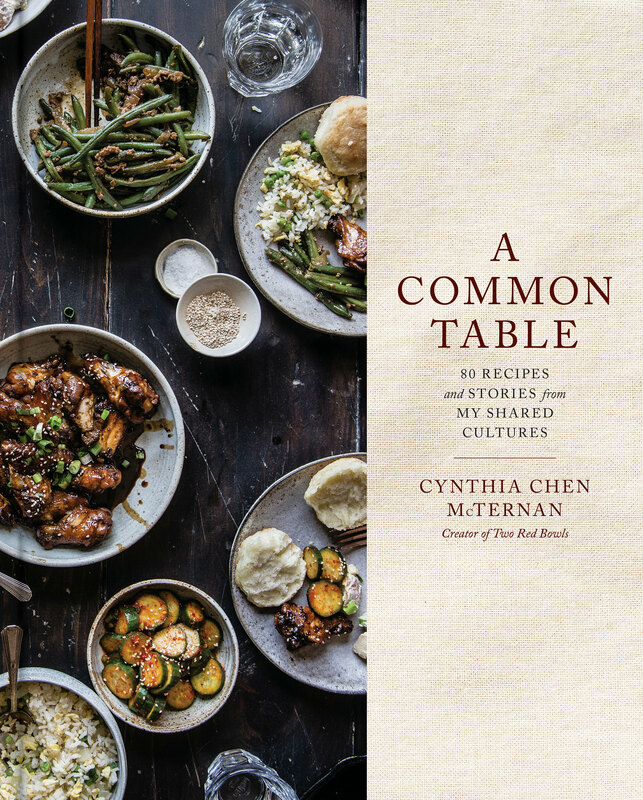 Way to go, Cynthia! I haven’t worked up the nerve to do it but I’m hoping to in 2014. It looks fabulous! Even more fabulous though are these individual sized crumbles. I absolutely love your recipes for two (simply because I always baked giant pies ‘n cakes and end up eating them all myself!). I know that cheddar + apple is a classic combo but I’ve never eaten them together before. 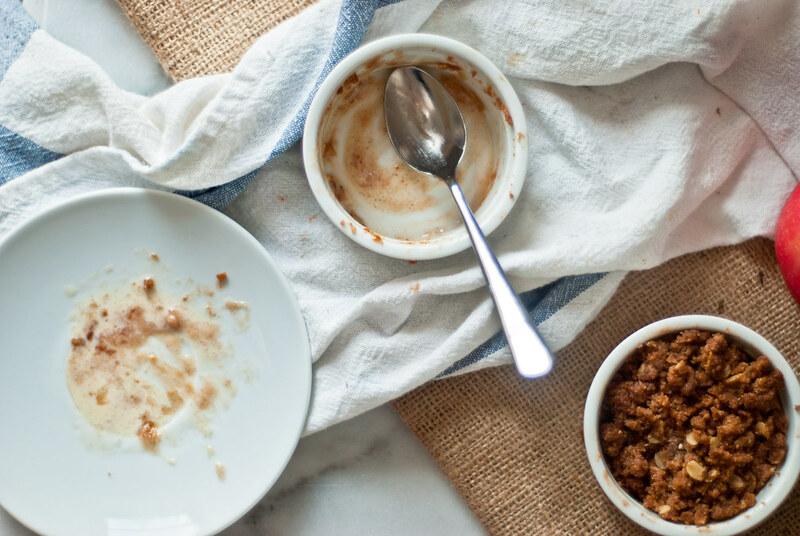 You’ve sold me on this crumble – I need to try it for myself! And a huge thanks for including my pie in your round up. I’m super flattered! Awww, thank you so much, Nancy! I really wasn’t sure about whether I had the nerve either, and was second-guessing myself the whole way, but I really enjoy it so far. If I can do it, you definitely can. Your blog is beyond fabulous (so of course I had to link to your gorgeous pie!). 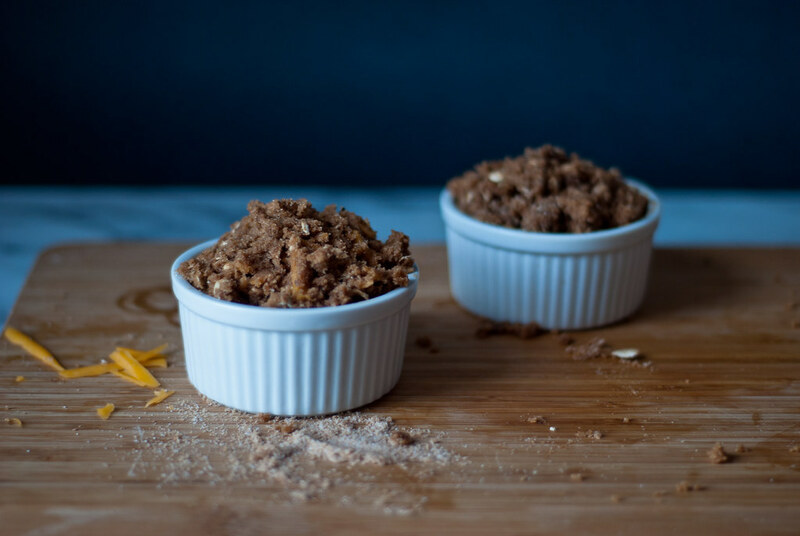 Definitely let me know what you think if you try this crumble! It’ll be our little secret! 🙂 Yes, moving was definitely scary, but so far I’m so glad I did it. It’s a little unsettling not to have the structure of WP.com to be a safety net for views and such, but like you said, this does feel like a new home, and an opportunity to change and improve — so I’m so happy I made the decision. It’s encouraging to know that you thought so too! Thanks so much for commenting, Courtney! I welcome cheddar at any minute so this recipe has me extremely happy! Looks AMAZING! As for brown butter, unfortunately I can’t stand the smell of it! Loving the new look, particularly the ‘Find me on …’ section. Where did you find that?? Oh, must look out for you on Flickr! Haha, I felt the same way! I love fruit and cheese together, and yet the moment when I was holding a handful of cheese over my crumble topping, I almost couldn’t go for it! 🙂 But it really worked, I thought. Ooh, and I can definitely understand being put off by the smell of brown butter. It was so unusual the first time I tried it. Thanks so much, Johnny!! I actually just did those banners on Picmonkey.com with some random filters and overlays and such… Very easy, I promise! 🙂 But so happy you liked it, and yes! Let’s be Flickr friends!! Thank you so much! Hope you like it if you try it! OMG I thought I noticed something different about your blog! I skimmed through it quickly the other day and now when I passed by I just thought to myself, “wow I think she changed something here” And there you go, you just confirmed it. Did you convert on your own or did you hire someone? I’m converting within the next few weeks myself as a birthday gift 🙂 Pardon my rush to ask. I’m just excited for you that you made the big switch and I completely understand the confusion. Going through that process right now. Hahaha, phew! I feel very black sheep this week 🙂 and I wish I was baking pies! 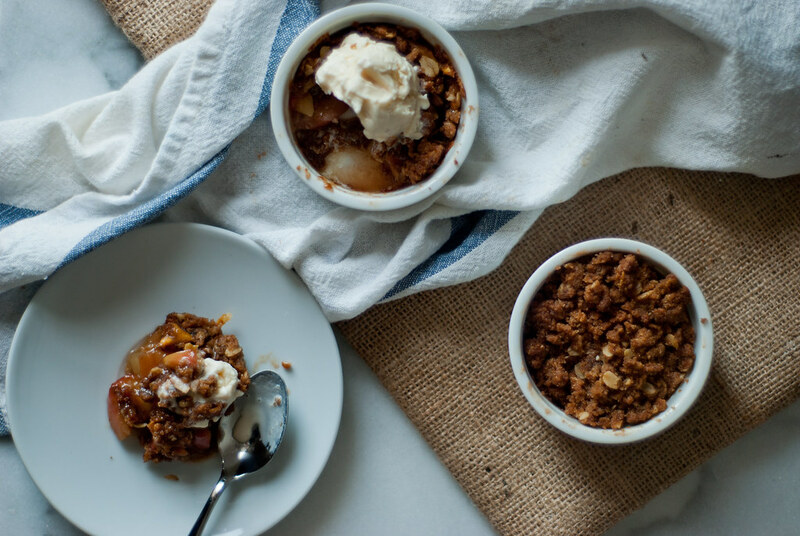 So I’m glad this crumble is still getting some love. Hi! thank you for this, I made it tonight and it’s great! But I forgot to add the cheddar in the end, and now that I re-read the recipe I can’t figure out when or how I was supposed to add it… Did I miss something?!? Oh my GOODNESS, I’m so sorry!!!! No, you most definitely did not miss something! When I made these I added the cheddar last minute on a whim, and turns out I forgot to update the recipe with it other than in the ingredients list. I am so sorry about this! 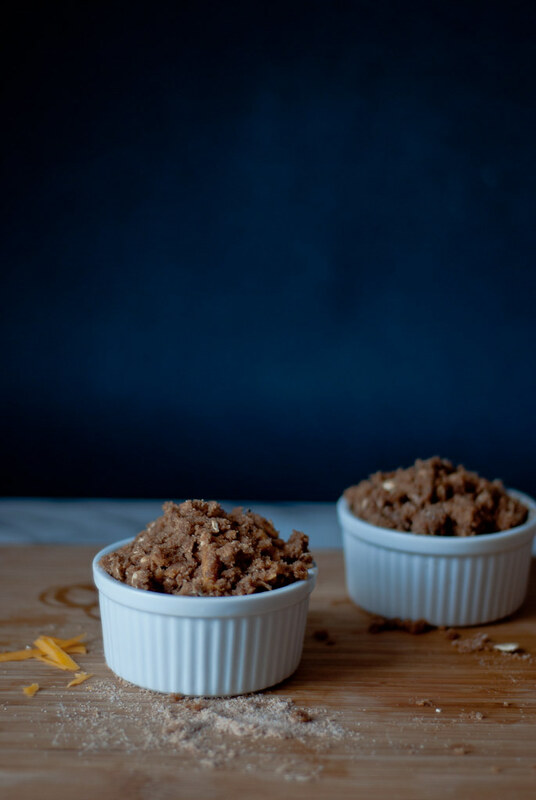 It’s edited now — you can really put in the cheddar at any time you like (on top after the oat topping, or mixed into the dry ingredients, or just sifted in after you cut in the cold butter). I even added more after baking and just let it melt into the crumble as I ate. I am SO sorry, Bianca — I hope you still enjoyed it! It was great, no worries! Oooh, genius. I love it. So glad you still liked it! 🙂 And hope you like it with the cheese, too! These look delicious! That crumbly topping, and the savory cheese, mmmm. I love the idea of a small serving – I made an apple pie this weekend and feel like my husband and I have been eating it for days! This is a wonderful crumble. I’m going to copy you and make it for sure. Especially like the cheddar in the recipe as well as the portion size. I adore your new look. Your “like” showed up on my post and it appeared I was not “following” you so I clicked on and sure enough! Changed. I clicked “follow” again so hopefully I’m in. 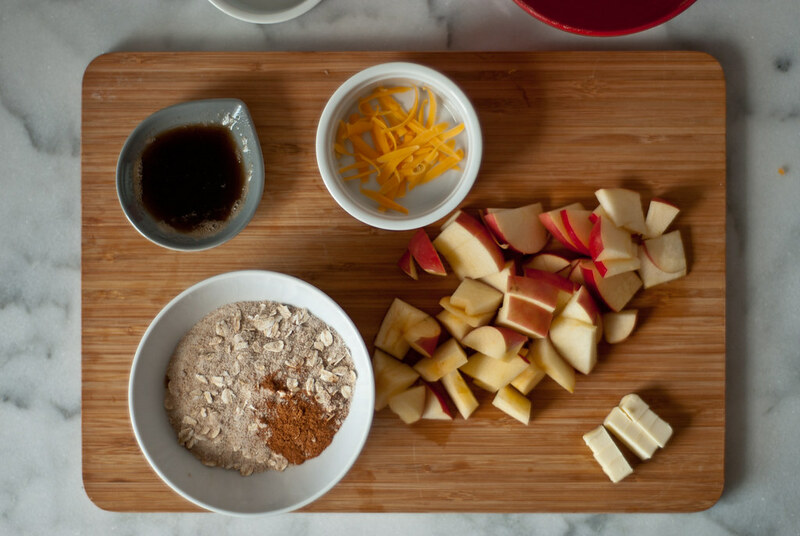 Oh my gosh….apples and cheddar are just divine, but adding browned butter? Over the top! This just looks soooo delicious! I love the new layout. It looks really nice! And I’ve nominated you for the Liebster award! Hahaha, I was wondering if I was going overboard!! But with these, the answer is too much of a good thing is just an even better thing.. Lol.